Chuka Umunna has withdrawn from the Labour leadership race after just three days, saying he is not comfortable with the “added level of pressure” that comes with being a candidate. Ummuna was considered by many to be a front-runner in the race to succeed Ed Miliband, who resigned earlier this month after his party suffered a crushing defeat in the UK general election. The Shadow Business Secretary said in a statement: “As a member of the Shadow Cabinet, I am used to a level of attention which is part and parcel of the job. I witnessed the 2010 leadership election process close up and thought I would be comfortable with what it involved. “One can imagine what running for leader can be like, understand its demands and the attention but nothing compares to actually doing it and the impact on the rest of one's life. 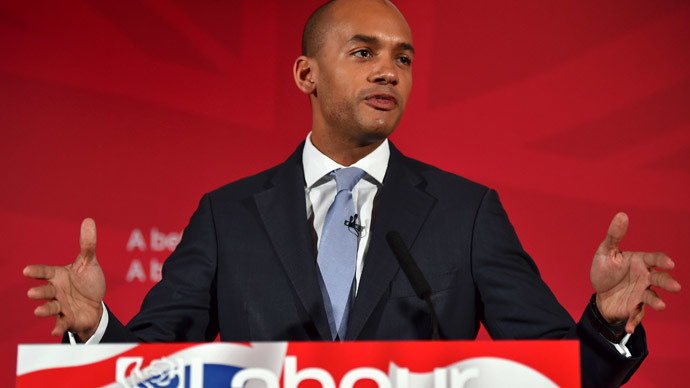 Umunna said he would continue to serve as Shadow Business Secretary and hoped to “play a leading role” in Labour's campaign to keep the UK in the EU during the impending in/out referendum. He also publicly apologized to all those who have supported him in his bid. “And if it's the result of pressure on an extended family or an extended group of friends, I think that’s a very sad reflection on our political culture,” he commented. There are now four declared candidates in the race: Shadow Health Secretary Andy Burnham; Shadow Home Secretary Yvette Cooper, Shadow International Development Secretary Mary Creagh; and Shadow Health Minister Liz Kendall.